A dragon warrior has a higher calling. He must ensure that ‘kung fu’ does not become endangered. He must show China - and all the world - that kung fu is not dead! He must show this, in particular, to that horrible villain, Lord Shen, the slim and slimy, rude and ruthless peacock. But can our dragon warrior, the panda called Po, and his band of brothers and sisters, the furious five, succeed? Can Po get the ‘inner peace’ he needs to overcome the aggressor? Can Po find out the secret behind a disturbing memory? Can Po confront the hidden truth about his parentage? Can he consolidate his strength from the memories of parents he had never seen? Can Po fulfill the prophetic statements of soothsayers, and free China from the evil? The answers to these questions lie in the movie - A movie with animation that I felt was cutely captivating, magically mesmerizing, and simply superb. Using the latest technology that resulted from the invention of fireworks in China, the evil Lord Shen uses fire cannons to terrorize and subdue people, village after village, across China. But, our reluctant hero, the loveable, cuddly, rotund, black-and-white bamboo-lover, the protagonist Po (voice of Jack Black) must now lead his friends as they traverse the mountains and lakes to meet their nemesis, and to end his evil plans. They must wade through dangers and perils unknown. And they must use kung fu to thwart the dark forces. This team, the furious five, who include Tigress (Angelina Jolie), Monkey (Jackie chan) and Viper (Lucy Liu), go on to show us the importance of realizing our destiny, embracing our responsibility and ridding the world of evil that mocks tradition and culture. Like all typical Hollywood villains, specially from James bond movies, Lord Shen has the aspirations of ruling the whole world. He dreams of controlling the whole of China. But like all such villains, Lord Shen must be taught a lesson. Which is what Po’s ultimate mission is. Like Po, who does not know how Lord Shen’s fire-cannons spew such venomous fire, I do not know how they make these animation movies. 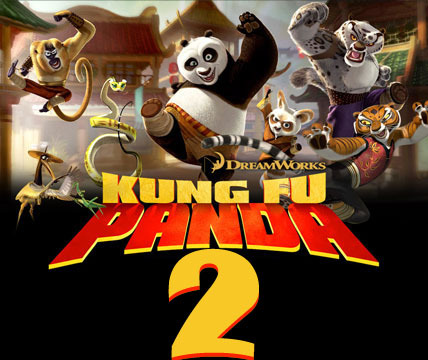 But I do know that the blending of music, visuals, and voice has resulted in this fascinating production called Kung Fu Panda 2. With spectacular scenic beauty, stunning visual appeal, fast paced excitement, crispy, witty dialogues, this is a movie worth watching on the big screen. My children loved it. I loved it. I am sure you will love it too. But please go to the movie taking with you that wonder and awe, and that delight and joy, that a child has.